Malaga is a city known for its sunny beaches, historic monuments and picturesque streets, but it's also home to a delicious and varied gastronomy. Located in the heart of the “Costa del Sol” (quite literally the Sunny Coast), Malaga enjoys almost 300 sunny days a year, and the city is filled with restaurants which take advantage of this beautiful climate. The “chiringuitos” are a common place to have a leisurely lunch or dinner right on the beach, and offer the best fried fish you will find! There are also “bodegas” that specialize in wine and tapas. You can find the best bodegas in the historical city centre or in some of the more upscale neighbourhoods. Malaga offers a wide variety of foods to choose from, but the most typical dishes are fresh fish (either fried or grilled) and the famous sweet wine. Other delicious dishes to try are the “ensalada Malagueña” (a typical salad), the “espetos” (sardines cooked on skewers over a fire on the beach), and “boquerones” (which is made from the same fish as anchovies, but prepared in a different way.) You can also try a special sandwich called a “campero” or the delicious “plato de los montes”, a dish piled high with different meats and sausages, as well as green peppers. With so many great restaurants it would be impossible to choose our favourite place to eat in Malaga. What follows are several gastronomic routes so that you will be well informed no matter where hunger happens to strike! You can begin the route in La Alameda where you can enjoy wine and tapas in one of the most typical bodegas of Malaga: La Antigua Casa del Guardia. Since 1840 this place has offered wines from around the world. Don't miss the Pedro Ximénez, a typical kind of sweet wine. As you continue down the Alameda you will find yourself on Calle Larios, the main street of Malaga. As you enjoy the atmosphere and history of the street, I recommend a stop in the Pasaje de Chinitas at the Bodega Quitapenas. Here you will enjoy some delicious tapas in one of the small side streets of the Historic Centre. And, if you have room for dessert, don't miss Casa Mira. They've been serving delicious ice cream since the 19th century. Calle Granada is a street full of small restaurants to try “pescaíto frito,” the typical fried fish and “cañas” (small glasses of beer). Of all the spots you might try on this street, El Pimpi is a must on any visitor´s list. You will love the atmosphere, the music and people inside. 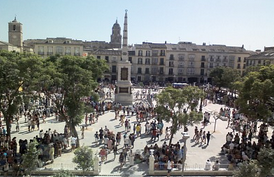 Calle Granada ends in a beautiful, rebuilt square called the Plaza de la Merced. The best tapas in the area can be found at Cortijo de Pepe. We recommend the “porra antequerana” (a different take on gazpacho). Last, but certainly not least, Restaurante Montana is located a short walk away and serves up delicious Mediterranean dishes with a back patio that is perfect for enjoying a cocktail in the warmer months. 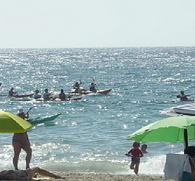 This area is located on the outskirts of Malaga, but it is known for some of the best “chiringuitos” in town. The “chiringuitos” are restaurants next to the beach where you can enjoy fish, either fried or grilled, along with salads and drinks. One of the most famous is El Tintero where the waiters walk around with the different dishes. As they walk past, they shout out the name of the dish in their hand and if you want it for your table, you have to flag them down. Another great place to stop is La Tortuga. This area is perfect for enjoying a drink on the beach, especially around sunset. If you find yourself getting hungry, check out Miguelito el Cariñoso. For an authentic experience, it can't be beaten. 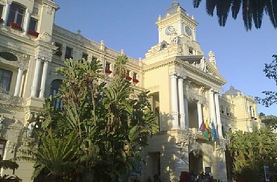 Teatinos is an area best known for the University of Malaga campus and there are lots of restaurants for tapas. You can choose between different styles and price ranges, but we recommend this area if you want a different, younger atmosphere. Samuel Perea is a restaurant that specializes in food that is typical of Malaga but with a new twist. In Cosa de Dos you will be able to serve yourself beer while you enjoy the “roscas”, hot sandwiches served up on round bread. For tapas and “camperos” on a budget, check out Tapa Loka, El Rail or La Bodeguita. This is by far one of my favourite areas of Malaga. You can really get a feel for the traditional neighbourhoods in Malaga as you walk through these streets. In La Trinidad I always visit El Tiburón Taurino because they have some of the best “pescaíto” (fried fish) served by the professionals. Another great place for fresh fish is Bar Mercado del Carmen. This bar is adjacent to the traditional market in the area of El Perchel, and the catch of the day is served fried or grilled along with the typical salads and side dishes of Andalucía. Malaga is one of the eight provinces that make up Spain’s southern autonomous region of Andalucía. The capital is Malaga city, birthplace of Picasso and the centre of a growing arts, cultural and restaurant scene. It’s also home to Spain’s 4th largest international airport, the gateway for most visitors to the area. With some of Andalucía’s most stunning natural parks, quintessential Andalusian white mountain villages, broad sandy beaches and Europe’s best climate, it is little wonder that Malaga is such a popular holiday destination. Yet more than anything, it is probably the warm welcome of the local people, the ‘Malagueños’ that leaves a lasting holiday memory. The Spanish are renowned for their love of children and family life, and visiting families are made very welcome; in restaurants, at cultural events, or at Malaga’s many visitor attractions. Less than an hour’s drive east of Malaga city is the beautiful town of Nerja, at the eastern edge of the Costa del Sol. The coast here boasts some of the best beaches in Spain and a unique subtropical climate; but for some ‘cool’ family fun head underground into the ‘Nerja Caves’. These ancient, huge caverns, with evocative names such as ‘Ghosts’, ‘Cataclysm’ and ‘Waterfall’ stretch for five kilometres and are fully accessible to all ages via spacious illuminated walkways. At the heart of Malaga’s Costa del Sol is the resort town of Benalmádena, home to some of the province's well-known family theme parks. Children will be mesmerised by the hundreds of delicate butterflies in the Thai-style tropical ‘Butterfly Park’. Make a day of it by hopping onto the City Sightseeing bus that stops right outside the Butterfly Park, and connects all the main sights nearby. The younger ones can play with dolphins, or swim with sea lions at the ‘Selwo Marina’ animal park, while older children can take a breathtaking rollercoaster ride at ‘Tivoli World’, or cool off from the summer heat at nearby ‘Aqualand’. Between the picturesque hilltop white village of Mijas Pueblo and the beaches at Mijas-Costa is ‘Karting Experience’. This is a high performance Kart track that will make any family day out a thrilling and unforgettable experience. This is adrenalin-pumping fun that all the family can share; there are twin karts, ideal for a parent with a younger child, adult karts, as well as models for juniors. Cheer on your family from the trackside cafe, or put your own driving skills to the test, whilst the youngsters try to beat you to poll position. There’s nothing like playing in the great outdoors to bring smiles and laughter on a day out. ‘Aventura Amazonia’, just ten minutes east of Marbella is a new tree canopy aerial adventure park. The whole family can enjoy the excitement of going from tree to tree via rope bridges and zip lines. There are challenges for all ages, and even a creche and a MiniKids area for toddlers. Enjoy the thrill of a tree top adventure in this Mediterranean pine forest, just minutes from some of Marbella’s finest beaches. Marbella’s upscale marina, Puerto Banús, is world famous for its extravagant yachts and luxury cars. This glamorous enclave makes for a fantastic day for the entire family; with boutiques, departments stores, cinemas, restaurants, as well as some great beaches. People watch for celebrities from a marina cafe: enjoy a meal at one of the trendy new family restaurants, or take in the latest movies in English. It’s not just a playground for the rich and famous; it’s also Marbella’s top family-orientated leisure area. For many years seen as the gateway to the beaches and resorts of the Costa del Sol, Malaga is fast developing as a city destination in its own right. The city’s most prominent landmark, the Alcazaba, overlooks the city in every direction from its rocky hilltop position. This Moorish fortress, the best preserved in Andalucía, can be seen from the sea many miles away and has greeted millions who have been arriving from the Mediterranean Sea to Malaga for centuries. Below the fortress is a Roman theatre from the 2nd century AD; proof that Malaga was attracting visitors long before the sun-loving tourists came along. Alongside its ancient heritage, Malaga has its share of unmistakably modern attractions, including the world-famous Picasso museum, celebrating the work of Malaga’s most famous son, and the recently opened Carmen Thyssen museum. Malaga’s airport, meanwhile, has undergone massive expansion in the last 10 years and now welcomes daily low-cost flights from many regional UK airports, with a regular train service connecting the airport to the city in 12 minutes and for a mere €1.30. With so many flexible flight options, it’s now easier than ever to add a night or two to a beach holiday and explore the rich variety of cultural attractions on offer in Malaga. Walk up from the cafés on the waterfront and the silhouetted stone towers of the Alcazaba, and it may look too far and too high for a leisurely stroll. But the path up is gentle, and well worth the physical effort as the panoramic view of Malaga and its harbour opens up slowly before you. Once at the top you, can enter the Moorish fortress (€2.10, free on Sunday after 2pm) and walk a full 360° circuit of the wall, admiring superb views of Malaga and the hills beyond. A small museum explains how the Alcazaba was used in medieval times to defend the city against invaders. Pablo Picasso was born in Malaga, so it’s only right that the city should house the Picasso Museum, which brings together one of the most comprehensive collections of work by this famous Spanish artist. Spread out over a dozen rooms within the old Palacio de Buenavista, visitors can gaze at Picasso’s abstract interpretations of ordinary subjects, while admiring some of the best examples of 16th century architecture to be found in Malaga. Don’t miss the film in which Picasso’s photographer provides a fascinating insight into his friendship with the man himself. Admission is €6. This celebration of 19th century Spanish art is a new arrival on the Malaga scene, having opened in March 2011. Housed in a grand 16th century baroque mansion, the former Palacio de Villalon, the Carmen Thyssen museum has a permanent collection of 230 works of art. Artists featured include the Andalucian masters such as Zurbaran, Villaamil and Barron. The museum also has a regular and varied programme of temporary exhibitions – an admission ticket with access to all areas is €8. As is the case with many other religious buildings in Andalucía, the grand cathedral of Malaga was built on the site of a mosque. Unlike the grand churches in Seville and Cordoba however, which were converted for Christian worship after the defeat of the Moors, the mosque in Malaga was completely demolished in 1488 on orders of the Pope to make way for a grand new cathedral. The church is commonly known as La Manquita, or One-Armed Woman, referring to the right tower conspicuously missing from the façade, omitted due to lack of funds in the final building phase in the 18th century. Take the time to walk around Malaga to spot many of the city’s hidden delights. As you make your way around you’ll spot many unusual sculptures and abstract works of art. Among the best-known is Hans Christian Andersen in the Plaza de Marina (he visited Malaga in 1862 and wrote very fondly of his time in the city); but there’s also the rather bizarre Ave Quiromantica, a half-hand, half-pigeon creation by local artist Jose Seguiri. Perhaps best known of all, however, is the Points of View sculpture by British artist Tony Cragg, which can be found on the busy Calle Larios. Clear the body of mucus. Blood and starch. Cassava - very bad for you. Cleanse the bowel of the mucus. Fixes everything. Copper and carbon cause electricity may help Alhazimers. Celebrate Bloomsday 2018 on the Costa del Sol. Note to circulate to Joyceans. Photographs from the Beach 2018. Talk Radio, Europe - tre - report and interviews by Ger Sweeney, Live on Eire,​ ​​ Monday 18 June 2018. ​ Listen from 43 to 53 minutes or the complete show is one hour. A little story from The Paris Review from 2018. Irish Literature: What Makes Irish Writers So Good? James Joyce by Roger Cummiskey.